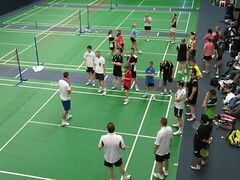 Saturday 10th October 2009, a 'peasouper' of a morning, dawned and we set off for Bolton Arena arriving at 9.15 a.m. to await to arrival of Gail Emms, Nathan Robertson accompanied by Andy Allford, fitness coach for Milton Keynes Badminton Centre. 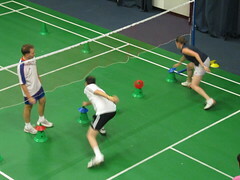 Despite the fog they arrived promptly and set to work preparing for the start of three by 2 hour courses which were being held throughout the day, with 30 players on each session. 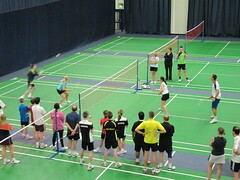 The event, which was set up by Ron Welsh ably assisted by Ray Schofield both of Forrest Badminton Club, was open to players from the Bolton Badminton League and any interested players from affiliated clubs in Lancashire. 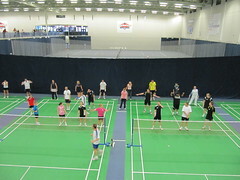 The first session was for youngsters from in and around Bolton, many of whom are connected to Forrest Badminton Club and to youngsters who were sponsored by the Bolton le Moors Junior Badminton League who play in the Bolton Schools' Badminton League. 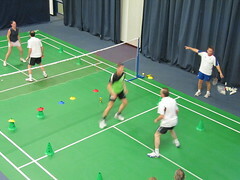 The start of the course was a very strenuous 'warming up' session. 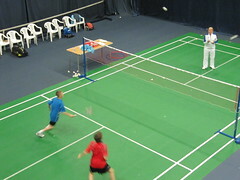 Not for the fainthearted!! 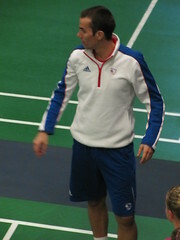 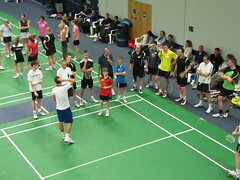 The warm-up included footwork and movement around the court at speed, this was led by Andy. 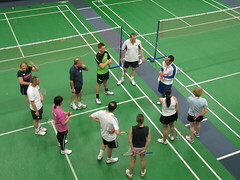 Following this, Gail, Nathan and Andy each did their designated discipline, which included, mental (psychological skills) technical, tactical (outwitting opponents) and physical (development of speed). 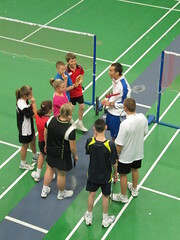 Each discipline lasted approximately 20 minutes before the groups moved on to the next coach. 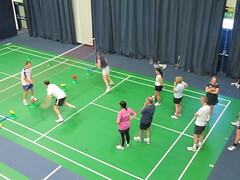 At the conclusion of the course there was a game of last man/woman standing whereby all males tried to outwit Nathan and females tried to outwit Gail. 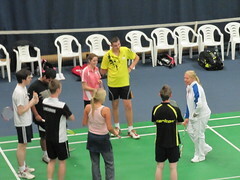 The last man/woman then got the honour of partnering Gail and Nathan for an exciting game of mixed doubles. 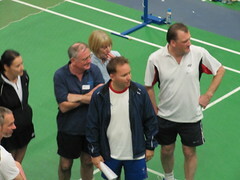 Rather fittingly the last course saw two members of Forrest B.C. 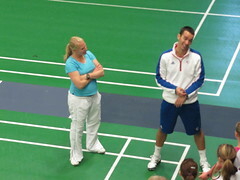 claiming the honour of playing with the stars, one of our 'A' team players, Paula Wright, and one of our promising junior boys, Chris Mealor. 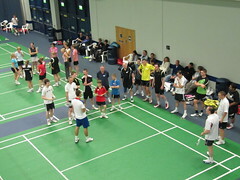 The day ran like clockwork, the 3 coaches had endless patience and at the end of each session gave plenty opportunity and time for autographs and photographs, Gail and Nathan brought along their medals for this purpose. 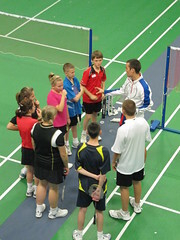 I would advise anyone who has the opportunity, to attend one of these masterclasses, you certainly won't regret it. 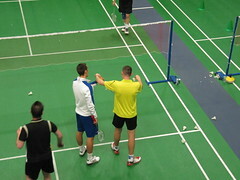 The time passed by so quickly and was one of the most exciting Saturdays I've experienced in a long time. 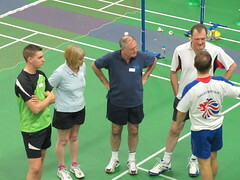 Thanks to Ron Welsh for getting the wheels in motion for the event, to Lisa Harrison for taking and making telephone calls and to everyone else involved in making the event possible. 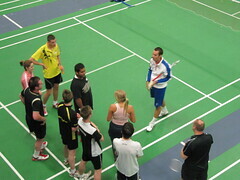 A big thank you from Forrest Badminton Club to Gail, Nathan and Andy. 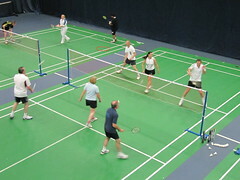 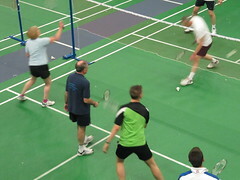 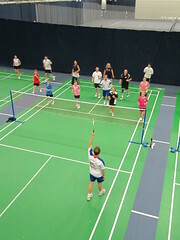 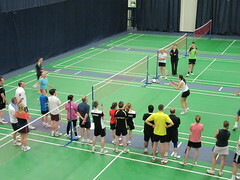 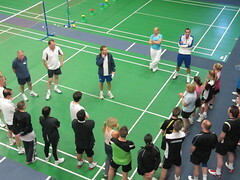 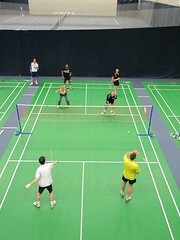 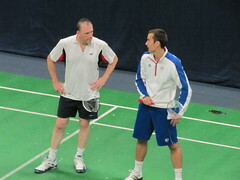 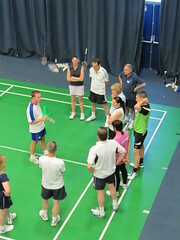 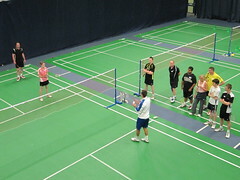 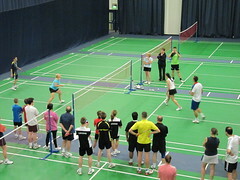 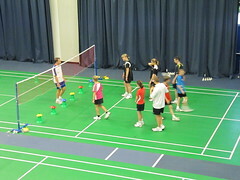 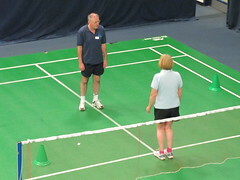 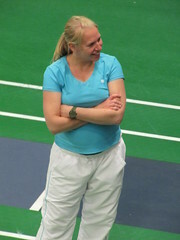 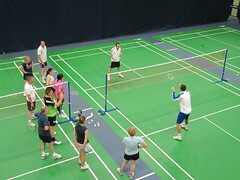 Check out more information about the master class sessions at www.badmintonmasterclass.co.uk.